I think it has some uses like with Baron Geddon, if control paladin becomes a thing. aka turn your Silver Hand Recruit into a Vampire. So many uses, so many synergies. This is a low key 5/5 high value high everything include in anything control; special mention to Kangor for some possibly ridiculous heals...Brewmaster Thekal for double armour incoming? If you thought you knew what you think I know, then you'd know I knew you knew I know. Thekal do not deals damage so it will not work. Don´t know it two copies will be good but adding one looks quite good. Thekal, Brewmaster Thekal. Then use some combination of Kangor and this with minions, heal it back up, Thekal, etc. Meta dependant but being able to get 60 armour+ is no joke. hard To say. It’s not terrible. There are some ok synergies. But those synergies have always existed for most buff cards and they’ve never really taken off. But also, flash of light occupies a similar space and is a better card. Healing yourself is waste of tempo, in most cases its 2 mana do nothing, you dont make your trades more favorable, awful card, never gonna see play. if you brewmaster a minion with a buff it doesn't retain it. It is obvious he didn't mention for Thekal gets lifesteal. I guess he meant use thekal then brewmaster on him. 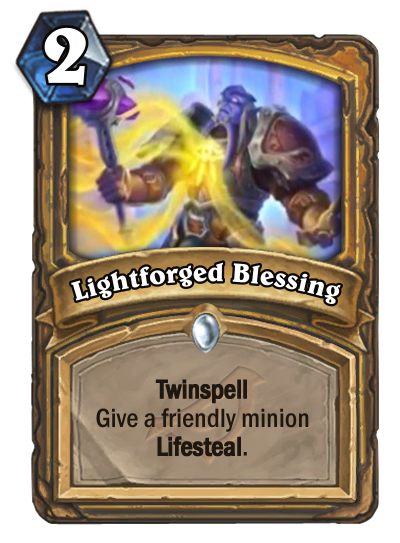 Then fully heal yourself with using some combo with Lightforged Blessing. Then use Thekal again. Well it is still a hard play. If he mentions Thekal gets lifesteal that's a huge fail, even thekal deals damage, Lightforged Blessing doesn't give lifesteal to a minion in HAND. Memedeck-seeker. Always tries to build new decks. Hates tournements, streamers, netdecks and poor-o players. ah, but a tournement mode could be great !!! I don't want to be rude, but I can't understand you. What do you mean by brewmaster thekal? High Priest Thekal has a battlecry effect. You can't give this minion the aforementioned paladin spell, while he is in your hand. When you play him, he SETS all but 1 of your life to armour. He doesn't deal damage, he just sets your health. On the following turn, when he is able to attack, he will inflict 3 damage and heal you for 3 as normal. So I don't understand what you are trying to say. You heal yourself back to 30 before playing Thelal again. Oops, my bad. However everyone can pull this off right now as long as they find a way to heal themselves to max. So getting 60 armour is not a big deal.